MONDAY, OCTOBER 19, 2009 AT 7:00 P.M.
COMMISSION CHAMBERS, CITY HALL, 106 N. 12TH ST.
4. Consideration and possible action relating to a request for Commission approval of the Consent Agenda. All matters listed under Consent are considered by the City Commission to be routine and will be enacted by one motion. Any Commissioner may, however, remove an item from the Consent Agenda by request. A motion to adopt the Consent Agenda is non-debatable. A. Approval of October # 1 Payroll in the amount of $34,307.99. B. Approval of Claims in the amount of $32,655.98. C. Approval of Minutes of the October 5, 2009 Regular Meeting. D. Approval of street closure for Annual Just Treats No Tricks Halloween Parade set for October 31, 2009 from 5:30 to 6:00 p.m. on Main Street from 12th to 9th Streets. E. Approval of street closure for Annual Veterans Day Parade set for November 11, 2009 from 10:45 a.m. to 11:45 p.m. on Main Street from 14th to 9th Streets. F. Approval of Interlocal Agreement for Jail Services with the City of Owasso for 2010. 7. Discussion, consideration and possible action to adopt Ordinance No. 840, an Ordinance amending Ordinance No. 606, the Zoning Code of the City of Collinsville, Oklahoma, by approving CZ-174; repealing all Ordinances in conflict herewith; and declaring and emergency.-- approved, The existing "Cardinal Corner" building on SW corner of 5th & Main is planned to be torn down and replaced with a new convenience store. It was recently discovered that a portion of the property still had a residential zoning despite years of commercial use. The planning commission had already approved the corrected zoning. 9. Discussion, consideration and possible action to adopt Ordinance No. 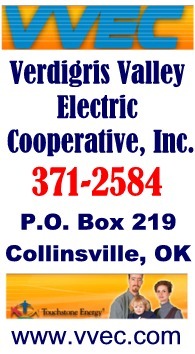 838, and Ordinance granting a nonexclusive Franchise to CoxCom, Inc., its successors and assigns to construct, operate and maintain a Cable System within the City of Collinsville, Oklahoma for a period not to exceed five (5) years; defining the nature of the agreement; stating the obligations of CoxCom, Inc.; stating the obligations of the City; providing for codification and declaring an emergency. -- approved, with wording changes discussed at previous meeting (including insurance coverage) made to the agreement. Based on the discussion at the previous (Oct 7th) meet material purchases would begin immediately to start installing lines in Collinsville as soon as possible this year. 11. Discussion, consideration and possible action on Pole Attachment Agreement with CoxCom, Inc. d/b/a Cox Communications. -- item tabled as more wording changes (related to a MESO form) were still in the work per City Attorney Ken Underwood. 12. City Manager Report. -- None, as Pam Polk was out of town at a conference representing the city. IF YOU REQUIRE SPECIAL ACCOMMODATION PURSUANT TO THE AMERICANS WITH DISABILITIES ACT, PLEASE NOTIFY CITY HALL BY 3:00 P.M. THE DAY OF THE MEETING. 3. Consideration and possible action relating to a request for Trustee approval of the Consent Agenda. All matters listed under Consent are considered by the Authority Trustees to be routine and will be enacted by one motion. Any Trustee may, however, remove an item from the Consent Agenda by request. A motion to adopt the Consent Agenda is non-debatable. A. Approval of October # 1 Payroll in the amount of $22,698.90. B. Approval of Claims in the amount of $297,585.50.